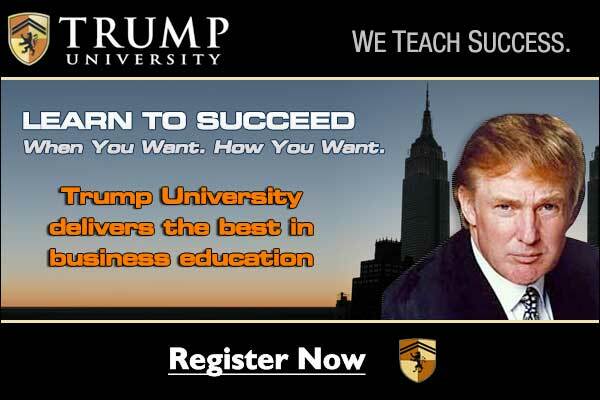 Pretend GOP Presidential Candidate Donald Trump has run into a lot of trouble over a seminar/career development/college/marketing project he ran for awhile called Trump University. Back in 2010 New York State demanded that he stop using the word “university” to describe what he was running. The “use of the word ‘university’ by your corporation is misleading and violates New York Education Law and the Rules of the Board of Regents,” said Joseph Frey, the state the deputy commissioner for higher education. The problems didn’t end there. The company, now called the “Trump Entrepreneur Initiative” also faced lawsuits. Tarla Makaeff sued Trump University and Donald Trump in 2010, in a proposed class action alleging deceptive business practices. Makaeff claimed she shelled out $60,000 for a real estate program that consisted of seminars that were little better than infomercials. Trump University countersued , accusing Makaeff of defaming it in online postings and elsewhere. Makaeff moved to strike the counterclaim under California’s anti-SLAPP law. U.S. District Judge Irma Gonzalez denied the motion, but the 9th Circuit reversed in 2013. Makaeff’s attorneys sought hourly rates of $250 to $440 for associates and $600 to $825 for partners, citing a 2007 survey in the National Law Journal and their experience handling class actions. This number is not actually about the money Makaeff (quite foolishly) shoveled over to Trump for this education she was supposed to get. This money is just about the legal fees she was supposed to have accrued dealing with that countersuit from the Trump company. For someone who seems so disgusted and injured by the institution, she sure seems to be having a hard time getting away putting this behind her. The Trump Organization, which owns the pseudo college, says it plans to appeal the award. Because, you know, it’s just a swell company like that.